CCI comes through with the classics in these 40 grain Lead Flat Nose .22lr cartridges. 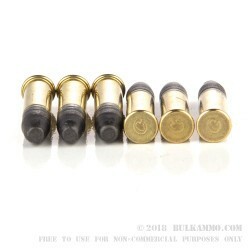 Not unlike something your grandfather may have practiced marksmanship with as a kid, these unjacketed bullets hearken to an age when ammo technology was still in its infancy. Before Hollow Points, or even Jacketed bullets, we had Lead Flat Nose rounds. Even the price will make you nostalgic! 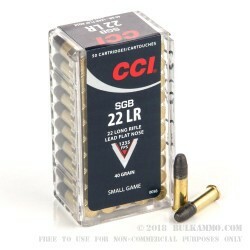 You'll surely be brought back in time by CCI's SBG .22 LR cartridges. CCI's 40 grain LFN .22LR cartridge travels at 1,235 feet per second of muzzle velocity and produces 135 foot pounds of muzzle energy. The rimfire casings are not readily reloadable. The cartridges come packaged in nose-down standoffs integrated into a plastic tub with a slide-off lid. 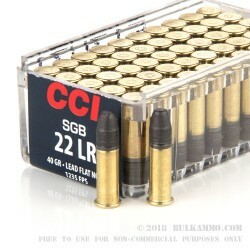 This product is for a single box of CCI 22lr that contains 50 rounds.